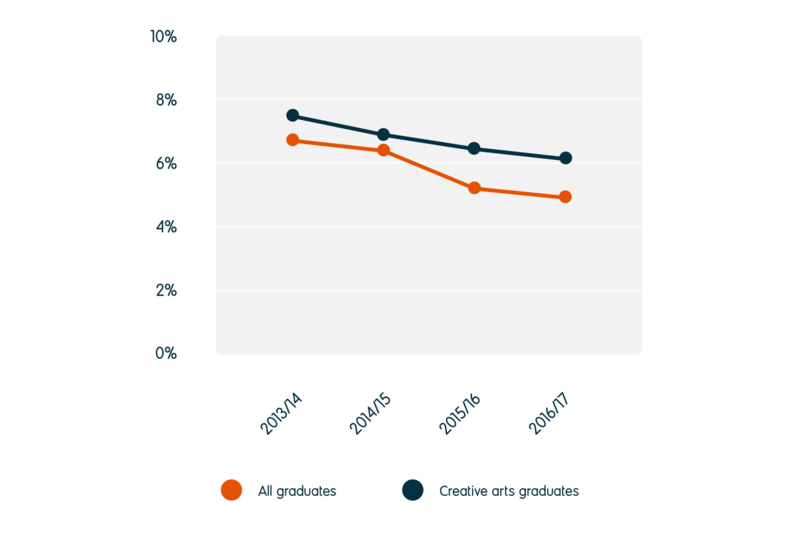 Creative arts subjects appear to be losing popularity, with a 5.4% decline in graduate numbers since 2012/13. 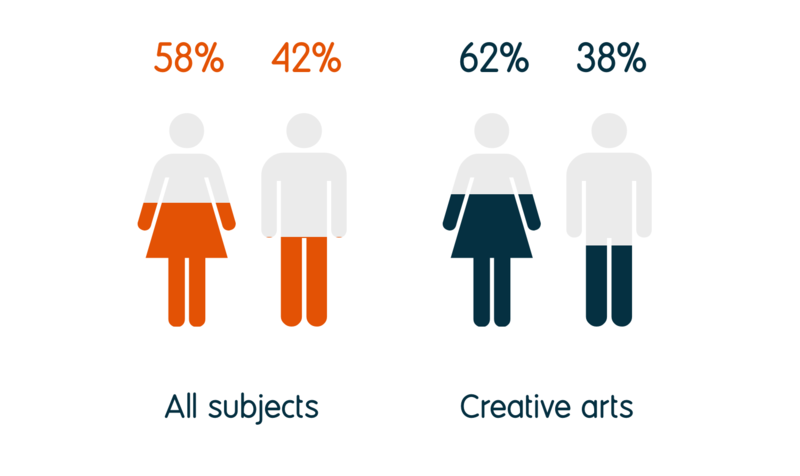 The gender split across all of the subjects in creative arts was weighted toward females, as in the case of fine art, where females outnumbered males three to one. Media studies had the smallest disparity with 1.1 females graduating for every male. There has also been much dialogue around the gender pay gap and the expectation of long working hours, which could contribute to the inequality of numbers between the genders as women still tend to have childcare responsibilities. The question then would be - where do all the female graduates go? It's a question that is far too complex to go into in this article, but one that could and should be addressed. Creative arts graduates are commonly in a variety of jobs, often related to their degree on a part-time or freelance basis, as well as having employment elsewhere in order to secure a steady income. This approach to employment is referred to as having a 'portfolio career'. Twice the number of creative arts graduates reported that they are working part time compared with graduates from other disciplines, with those from fine art having the highest percentage of graduates working part time at 28.8%. Fine art also has the lowest number in full-time employment at 36.4%, through to design with the highest at 56.8% in full-time employment. Media studies graduates had 50.8% in full-time employment and performing arts were at 41.8%. 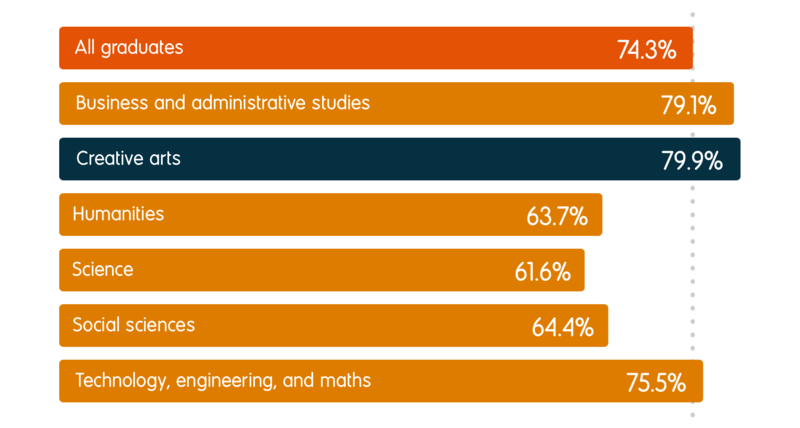 These figures are comparable to other graduates from subjects across social sciences and humanities, although in some cases quite a bit lower than the overall average for graduates employed full time (55.2%). In terms of destinations considered as being professional-level employment, design had the highest figure at 70.8% and fine art the lowest with 53.5%. However, these figures can be influenced by how the graduate answered the survey. Due to the nature of their portfolio-style working life, they may have answered the survey with their steady income in mind as opposed to their creative endeavours, and often their steady income will come from employment not considered as being at a professional level. Of all the subjects, design graduates were the most likely to stay in the sector, with 46.6% finding employment in arts, design, and media professions. Media studies was the only subject that had a significant number go into another professional-level sector, with 17.3% in marketing, PR, and sales professions. 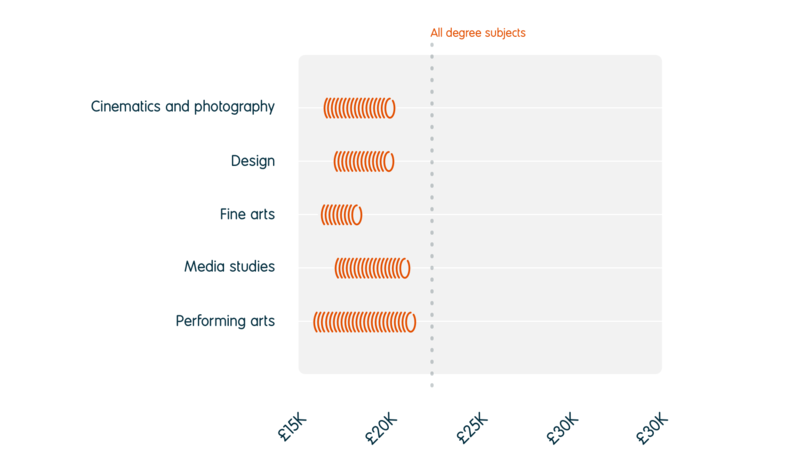 Salaries across the sector went up, as they did across graduate employment in general, with performing arts having both the highest and the lowest figures - £21,500 and £15,800 - and all of the other subjects being between these two parameters. Due to the nature of the sector, self-employment, enterprise and freelance activities are common outcomes for graduates and this year was no different. The number of graduates working freelance was high across all of the subjects, with performing arts being the highest at 25.4%. The lowest was design at 13.8%. These figures were quite a bit higher when compared with the general graduate population, where the figure was 4.9% in self-employment. All these figures reinforce the message that creative graduates are expected to be enterprising, proactive and ready to make their own space in the industry. The numbers in a permanent contract were lower than average (61%), with performing arts being the lowest at 38.6%. This, however, is the nature of the sector and it's a pattern that's likely to continue, as creative professionals are often employed on short-term contracts. Artist - most reported job title amongst fine arts graduates with 21.4% working as artists. Graphic designer - 18.1% of design graduates found this type of work. Actor, entertainer, and presenter - 10.4% of performing arts graduates were employed in these roles. 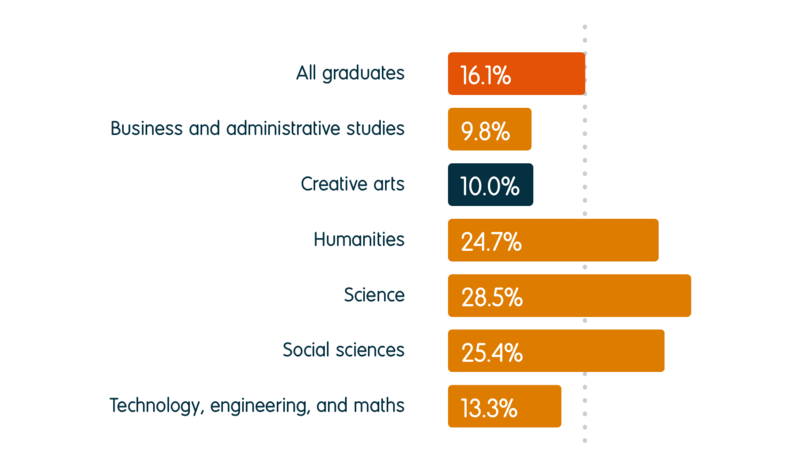 Arts officers, producers, and directors - common among media studies graduates where 11.3% entered these jobs. For all four subject areas, retail and sales occupations were the second most reported area of employment. This could be due to graduates completing the survey with their steady employment in mind as opposed to the creative work they may be involved in. The survey of graduates that forms the basis of this article, Destinations of Leavers from Higher Education (DLHE), is conducted six months after graduation. This does not always go in favour of creative graduates as they are often developing ideas, working on projects and making valuable contacts at this time. The nature of their careers and the portfolio approach does not fit in well with the survey. The statistics for this group are far from negative and the unemployment figures are no worse than many other subject areas. In fact, the unemployment rate fell by 1.3 percentage points for media studies graduates. This subject also had the highest percentage in the unemployed category from the creative subjects at 7.5%, the lowest being performing arts at 4.7%. Underemployment (graduates not in professional-level employment) was on a par with subjects within humanities and social sciences. Again, it will be interesting to see how the new approach to surveying students will affect this figure in all areas, not just creative subjects. The number of those going on to further study was highest in both fine arts and performing arts at 14.4%, with the lowest figure belonging to design (5.9%). As 16.1% of graduates across all subjects went on to further study, it confirms that the creative subjects are slightly lower than the average. However, across the general workforce the creative sector boasts the highest level of education, with 78% holding degrees compared with 32% across the UK workforce as a whole. Women working in the creative sector have an even higher percentage with 81% holding a degree.5 Performing arts had the highest figure for graduates entering teacher training with 27% going on to study a postgraduate teaching qualification. The growth in this sector is promising for those undertaking a degree in these subject areas. However, it's more than just the degree that counts. A lot is expected of creative graduates. They must possess a wide range of soft skills as well as be technologically savvy and able to network effectively in order to acquire the contacts to get a break. Not only do they have to be talented, but they must be able to showcase their talent and sell themselves continually, as well as having the enterprise skills to carve out their own unique path. That being said, creative graduates seem to be more than capable of stepping up to the mark, year after year. 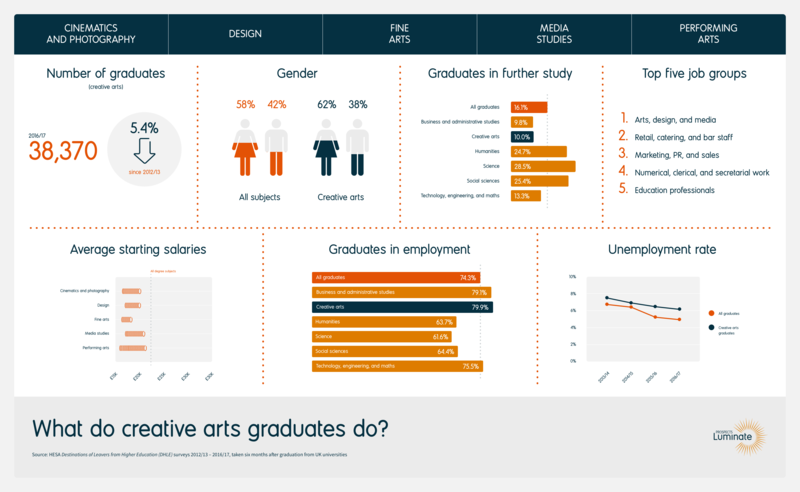 Download PNG file What do creative arts graduates do? Get an accessible version of the infographic data (PDF, 288KB). What do business and administrative studies graduates do? What do humanities graduates do? What do social science graduates do? What do technology, engineering, and maths graduates do? Creative Industries: Focus on Employment, Department for Culture, Media & Sport (DCMS), 2016. DCMS Sectors Economic Estimates 2017: Employment, DCMS, 2017. Lack of diversity within the UK's creative industries revealed, Dezeen, 2017. The Creative Media Workforce Survey 2014, Creative Skillset, 2014.